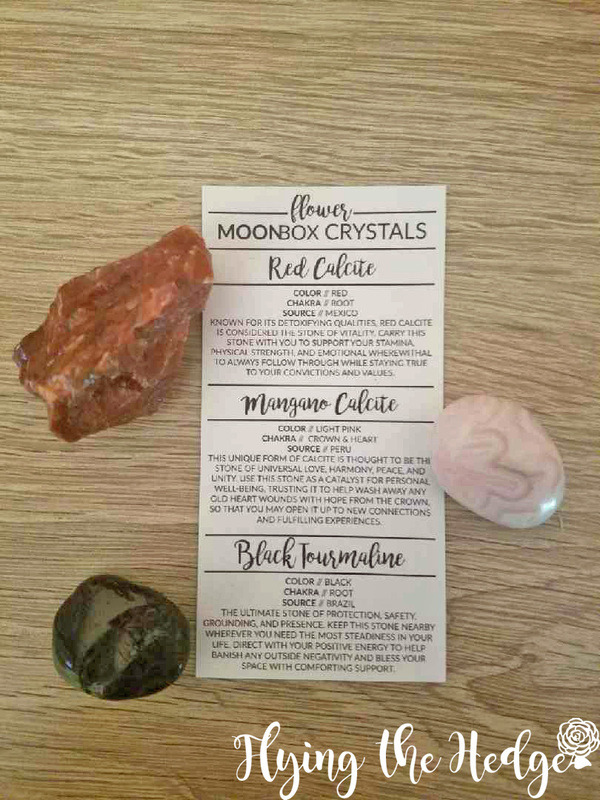 I was so excited to receive my Moon Box by Gaia Collective a couple of weeks ago. I am really enjoying this subscription box, much more than the Box of Shadows subscription. 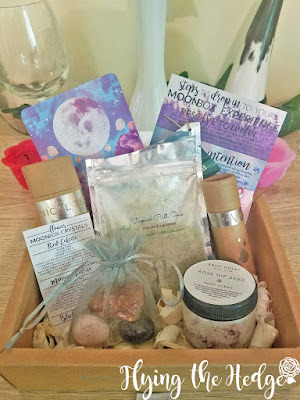 This month's box centered around the Flower Moon. 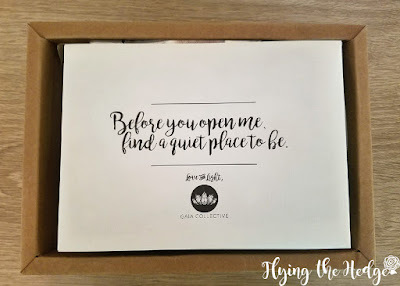 Upon opening the box I was once again greeted by an envelope asking me to find a quiet spot to open the box. I really like this message because it encourages mindfulness. Half the time when I open mail I simply rip it open, briefly see what is inside and move on. This little note forces me to slow down and enjoy the process. Inside the envelope were three cards: directions, moon oracle card, and crystal cheat sheet. The directions includes not only how to use the products, but where they came from, what the ingredients are, and how to use the items in your full moon ritual. I really like the step-by-step guidance and explanation of each item. It makes the items more meaningful, especially when they come from small pagan businesses. 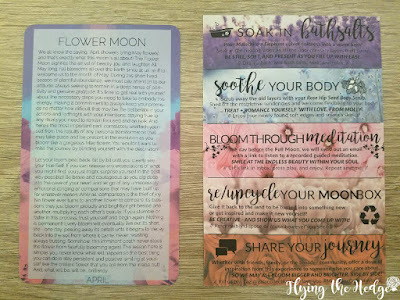 The Flower Moon Oracle card explained this full moon is a time of blossoming, whether in your personal life or career. It is a time to reaffirm goals and set intentions for the future. The artwork is stunning and the information informative. The only issue with this month's oracle card is it says April at the bottom instead of May. I had to double check my calendar to make sure I wasn't an entire month off. Haha! Other than that, this is a card I will hang on to. 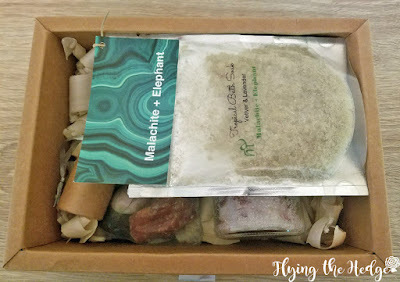 Underneath the card was a small bag of Tropical Bath Soak by Malachite + Elephant. As you can see from the picture I used this product on the night of the full moon. I took gorgeous pictures of everything in this box the day I received it, but accidentally deleted them thinking I had already sent them to my computer. Boy was I wrong! These bath salts smell earthy and calming (scented with vetiver and lavender) and contains bentonite clay which is wonderful for the skin. I should have added the entire package to the bath, but half was enough for me to smell the aroma and have a relaxing soothing bath. As I soaked I felt the day wash away. The aroma helped clear my head and allowed me to focus on the ritual ahead. 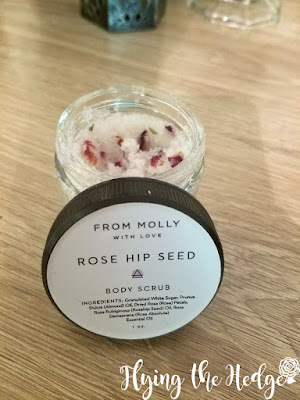 To go along with the bath salts was a rose hip see body scrub by From Molly With Love. The scent is subtle but luxurious. I think this was my favorite item in this month's box beside the tea. I love the smell of roses, especially in regards to beauty products. As you use it, the sugar slow dissolves, learning the oils behind to soothe the exfoliated skin. Using this with the bath salts left my skin refreshed and moisturized. Next was the crystals. This month's box contained red calcite from Mexico, Mangano calcite from Peru, and black tourmaline from Brazil. These crystals are gorgeous and were vibrating with strong energy. As per instructions, I meditated on each crystal. I first focused on the red calcite. It was cool to the touch, but as I meditated the crystal became warm around my thumb only. It glowed orange and made me feel alter and full of energy. This is the perfect crystal for strength, vitality, and stamina. Next was the Mangano calcite. It spoke of self love and calmness. As I meditated my guide, Fox, laid beside me, letting me know I am never alone and very loved. This will be a great crystal for when I doubt my own self worth. The black tourmaline, however, spoke the strongest to me, and I have been carrying it with me to help ground my emotions. While it is commonly used for banishing, it spoke more of power and protection to me. As I held this crystal I watched Fox nip at the heels of Fear and Doubt as they ran away. Things have been less than savory at home and despite the turmoil and the prospect of loneliness, the tourmaline has allowed me to feel more in control. Next I opened the essential oil and tea. 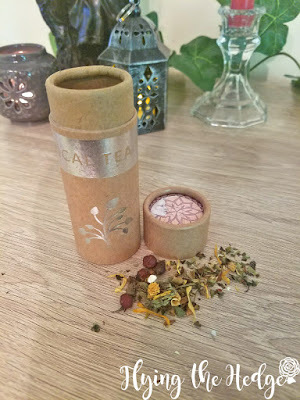 I love that each month comes with a tea specifically blended for the full moon. I am a huge tea drinking and this one was wonderful. I did not drink it the night of my full moon, but later in the week to help calm my nerves. This tea, handcrafted by Fruits of the Roots, contained passion flower, rooibos, hawthorn, holy basil, cinnamon, burdock, and peppermint. The cinnamon was predominant, with the other flavors being subtle. The essential oil, blended by Cottage Traditions was a mix of blood orange, lavender, sweet marjoram, hyssop, black spruce, and peppermint. It is a unique and empowering combination, reminding me of Yule instead of the Flower Moon. However, I understand the connection with growth and personal revolution. 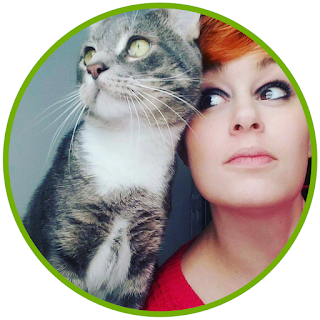 Finally, the day before the full moon, Gaia Collective sends out a guided meditation. I forgot to mention this in my last review as I forgot to listen to it prior to reviewing. This months was wonderful, focusing on inner self. 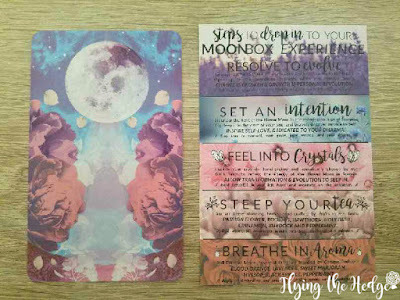 These meditations can easily be incorporated into any ritual or used whenever the time feels right. This personal touch is not something found in many subscription boxes, thus setting it apart from many others. Overall another WONDERFUL box. I cannot wait to see what next month has in store for me! 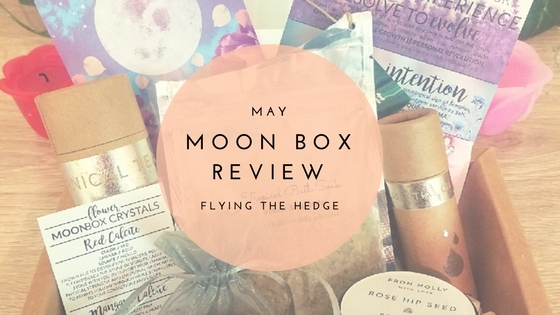 With next month's review, I will give a complete break down of the pros and cons of this subscription box, but let's just say, I don't have much to say against this subscription!